Like an awkward dinner with the Starks, it's impossible to ignore that winter is coming. But that doesn't mean your stargazing adventures for the year are at an end. The Orionid meteor shower runs from October 2 through November 7, and the shower's peak lands the night of October 21 into the morning of October 22 -- aka this weekend. 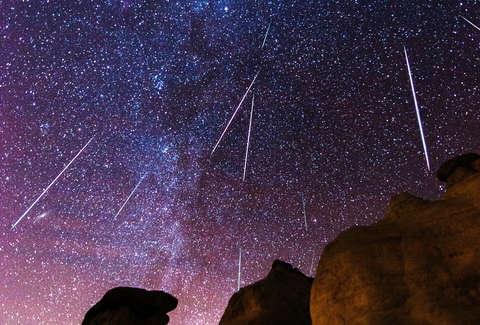 The celestial display may not be the most awe-inspiring shower of the year, but it's a beautiful show that could bring between 20 to 30 meteors per hour at its peak, Bill Cooke of NASA's Meteoroid Environment Office previously told Thrillist. Unfortunately, this year's peak will be marred some by the light from the moon, which will be nearly full the night of October 21. The meteors stem from what is arguably the most well-known comet that passes through our solar system, Comet 1P Halley, or Halley's Comet, which passes Earth once every 75 to 76 years. The Orionids, one of two meteor showers created by the comet, is a display created by the Earth's orbit crossing the trail of gas and dust left in Halley's wake. The display works on a 12-year cycle. At the peak of that cycle, you can see from 80 to 90 meteors per hour. At the other end of the spectrum, it produces just 10 to 15. We're moving back toward the higher numbers right now, but it's not all too close to 90. Additionally, the Orionids produce the fastest meteors of any shower except for November's Leonids. With meteors moving at 41 miles per second, they're amazing even if that's not the most friendly speed for watching the show. "The Orionids, because they're moving so fast, they burn up very quickly," Cooke told Thrillist. "In other words, you blink, you're going to miss them." If you're going to try to not blink, the best time will be around 2am that night. Though, good viewing with less interference from the moon can also be had the night of October 29, per Space.com.